Berke Breathed’s Bloom County was one of the most popular comic strips of the 1980s (the previous “most popular” strip being Garfield, and the next being Calvin & Hobbes). What always perplexed me about its popularity is that, well, for most of its run it wasn’t very good. And most of the best stuff is collected in this volume, the first of five from IDW collecting the whole series. 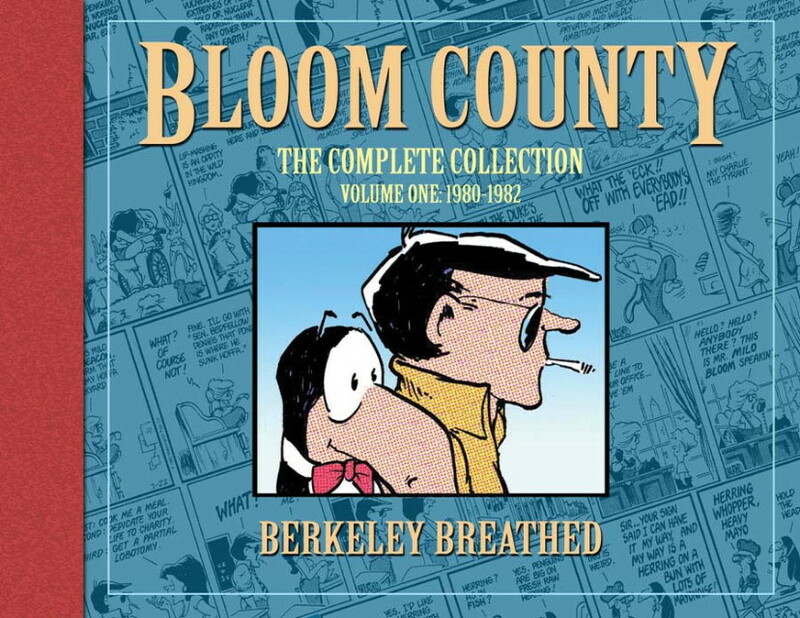 At the beginning, Bloom County was essentially a satire of small town America, as well as a satire of the rest of America as seen by people in that small town. Rather than commenting on American politics, as Doonesbury did, Bloom County focused on the quirks of pop culture (our inexplicable fascination with the British royal family, for example) and elements of local culture which had gained more visibility in the age of mass communication. But ultimately it shared qualities with many of the best comic strips: It was about its characters, especially smart-alec Milo Bloom, who was a young boy with a weird man apparently struggling to get out, and Michael Binkley, his insecure friend. The early cast also featured Steve Dallas, Cutter John, Bobbie Harlow, Binkley’s penguin Opus, Milo’s grandfather the Major, the perpetually-drunk Senator Bedfellow (maybe the best character name in the history of humor strips), Binkley’s father, and town busybody Otis Oracle. The strip was frequently off-the-wall, with a manic energy unlike most other strips in history. Breathed’s art both conveyed that energy and was more sophisticated than your traditional humor strips of the day (contrast it with the simplistic, repetitive art of Garfield, for instance). Despite all this I’ve been looking forward to this volume since it was announced, as it collects many strips which – as far as I know – haven’t been printed since their first newspaper run, and are from the period of the strip I enjoyed the most, those earliest years: Steve Dallas and Cutter John competing for Bobbie Harlow’s affections, Binkley’s insecurities, Milo as both the voice of reason and the journalistic hack hunting for Senator Bedfellow’s head, and the weird individuals inhabiting the rural community of Bloom County. I doubt I’ll pick up more than one volume after this one, but really, this one is all you need. It holds up pretty well 30 years later, its dated subject matter feeling more quaint than irrelevant, and it’s funny stuff. And as usual for IDW, it’s an attractive hardcover book, with an introduction and occasional strip comments by Breathed. A wonky chronicle of an unusual era, for both America and for comic strips.